For Cytisus proliferus var. palmensis: Chamaecytisus palmensis (Christ) F. A. Bisby & K. W. Nicholls, Chamaecytisus proliferus subsp. palmensis (Christ) G. Kunkel, Chamaecytisus proliferus var. palmensis (Christ) A. Hansen & Sunding, Cytisus palmensis (Christ) Hutch. The plant is often found in the literature under the taxon Chamaecytisus proliferus (L. f.) Link, also written Chamaecytisus prolifer (L. f.) Link. The name variant Cytisus prolifer L. f. is common. The epithet proliferus is sometimes considered as a mistake, as prolifer is the correct masculine form. However, some authors consider that the epithet proliferus should be preferred due to its long history of usage (Santos-Guerra et al., 1994). Tagasaste (Cytisus proliferus L. f.), also called tree lucerne, is a fast growing evergreen legume tree from the Mediterranean region. Tagasaste is a long lived perennial that can survive 60-80 years. It is recommended for sandy, hilly, gravelly soils in drought-prone areas where it can provide good quality forage all year round. Cytisus proliferus var. palmensis is the true tagasaste: it is the only cultivated type and has been naturalized outside the Canary Islands. The other types, known locally as "escobones", are not cultivated. However, these types are grazed by goats and lopped by farmers (Francisco-Ortega et al., 1993). Tagasaste can reach a height of 5-7 m, with a crown diameter of about the same width. Its root system is very extensive, and can grow as deep as 10 m or more. The branches are long, drooping, and leafy. Tagasaste has a variable habit and may be erect or prostrate. Leaves are trifoliate. Leaflets are linear, grey-green in colour, silky pubescent on the lower face and about 7 cm long (but variable). 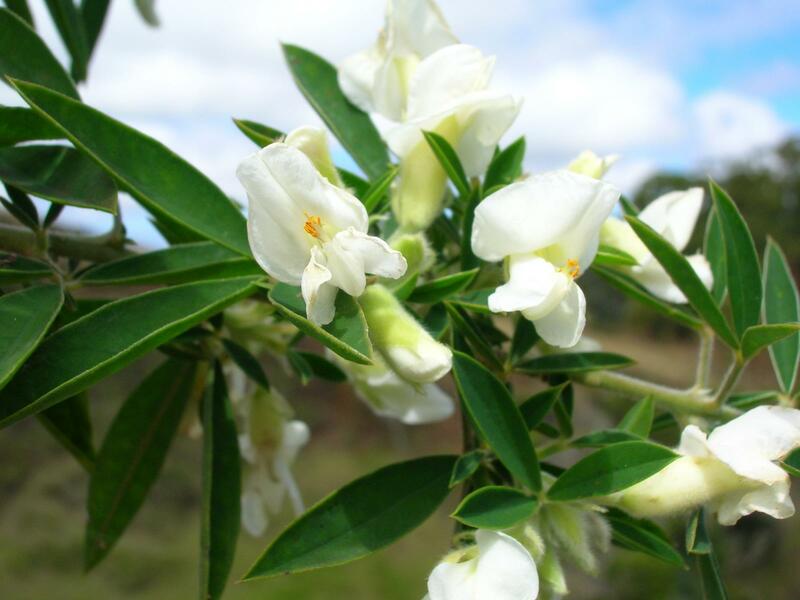 The flowers are pea-like in shape, creamy white in colour, scented and borne in axillary clusters. Flowering occurs in winter and attracts bees when other sources of honey are scarce. Once pollinated, flowers turn into black-coloured, flattened, 5 cm long pods. 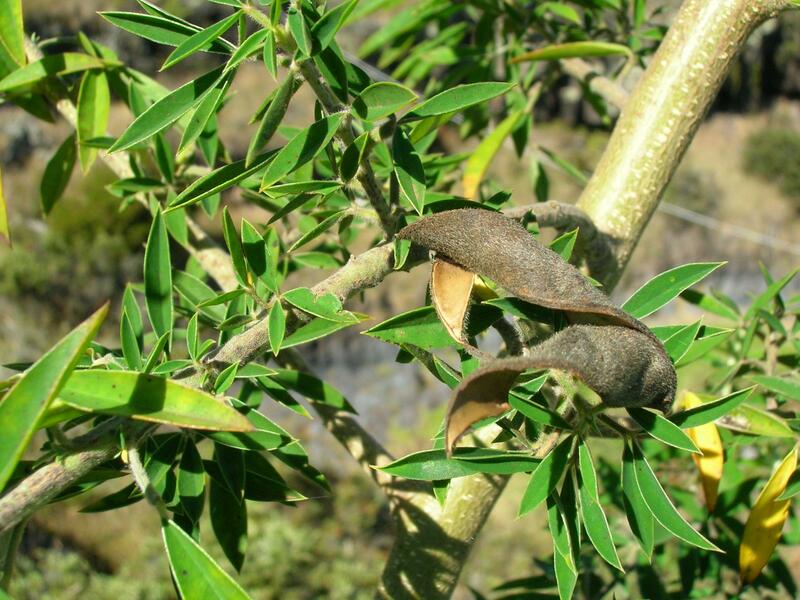 Tagasaste pods contain 10 seeds. 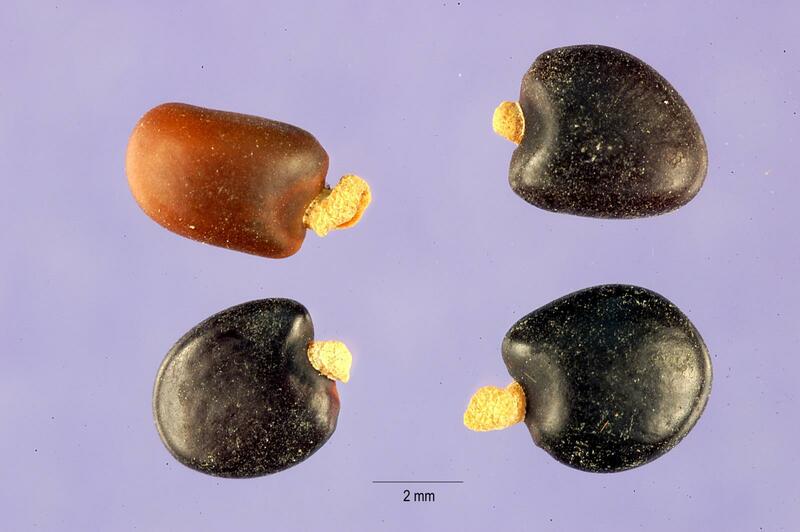 The seeds are small, flat and oval shaped, 5 mm x 3 mm wide, and are glossy black in colour (Ecocrop, 2016; Stokes, 2008; Cook et al., 2005; Newcomb, 1999; George et al., 2003). Tagasaste is a much valued forage, with good palatability and high protein content (Cook et al., 2005; Assefa, 1998; Newcomb, 1999). It can be grazed and cut for cut-and-carry systems. Prunings can be chopped and fed fresh as a wet leaf meal, or they can be dried and fed as hay (Esterhuizen et al., 2016; Cook et al., 2005). Tagasaste originated from the Canary Islands and became naturalized in most tropical highlands and Mediterranean-type climate areas with long, hot and dry summers, including Australia, New-Zealand, Ethiopia and South Africa. However, it is not common in the USA. Tagasaste can be found from sea level up to an altitude of 200-400 m in New Zealand, where it can grow in marginal coastal sandy areas that are adequately fertilized (Newcomb, 1999). Tagasaste has moderate tolerance of frost: adult plants can survive frost down to -6°C but young seedlings are killed by it and they should be planted (transferred) when the weather is frost-free. Tagasaste thrives in semi-arid areas where annual rainfall is in the range of 350-1600 mm, and it can survive with as little as 200 mm annual rain. Tagasaste thrives on acidic (pH ranging from 4.8 to 6.5) soils that are sandy, gravelly deep and well drained. Good drainage is mandatory where rainfall is heavy (Stokes, 2008; Newcomb, 1999). Alkaline and saline soils reduce tagasaste growth. Tagasaste is sensitive to waterlogging and wet heavy soils, and it should then be planted in raised beds if waterlogging is likely to occur. Tagasaste is propagated by seeds. The seeds are hard coated and should be scarified or soaked in hot water prior to sowing. They should also be inoculated with the same rhizobium as for cowpea (Vigna unguiculata) where tagasaste is not commonly grown (George et al., 2003). Tagasaste can be directly sown or transplanted once seedlings are 10-15 cm high. If the seeds are directly sown the seed bed must be well-prepared, weeded, and air pockets avoided. If the seeds are sown in heavy soils prone to waterlogging, they should be sown in raised beds. Tagasaste can be sown in rows at 2-4 m intervals between the plants and 4-8 m intervals between the rows. Planting can be done at anytime but not when frost is likely. In lower rainfall areas, end of winter should be preferred as the young plants will require some moisture. Young plants are very palatable to many domestic and wild animals, including rabbits and possums in Australia, and should be protected from them (George et al., 2003). Annual forage yields are 5-10 tons DM/ha in Ethiopia and 13-18 tons DM/ha in New Zealand (Ecocrop, 2016). Usually after a 10-24 (-36) months establishment period, tagasaste can be grazed by different ruminant species, including cattle, sheep, goats and alpacas (Orwa et al., 2009; Cook et al., 2005; O'Donoghue, 2011). Animals can graze down to a height of 20-30 cm (i.e. 70-80% of the leaves). After the first grazing period, vigorous regrowth occurs. This should be pruned so that tagasaste plants do not grow beyond 1-2 m high and remain available to livestock (Esterhuizen et al., 2016; Cook et al., 2005; George et al., 2003). Animals tend to strip the bark and may kill the plant, so it may be necessary to strip graze using an electric fence (George et al., 2003). Tagasaste can be cut and fed in cut-and-carry systems. It is harvested mechanically at a height of 20-50 cm during frost-free periods (because frost compromises regrowth). The fresh forage contains more dry matter (50-70%) than other forages and is easy to handle and give to livestock. However, tagasaste should be cut before the flowering stage, as flowering greatly reduces the nutritional value of the forage (George et al., 2003). 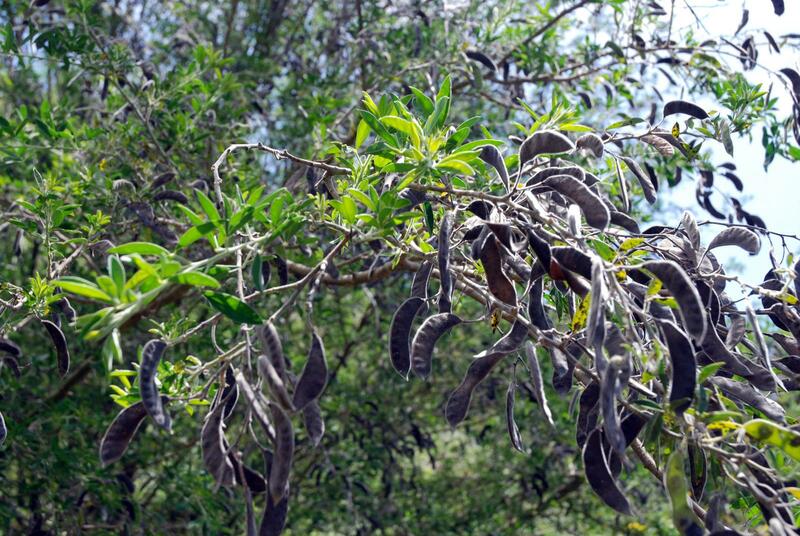 Tagasaste is an N-fixing legume that improves the nitrogen status of the soil, thus benefiting neighbouring grasses. Its extensive root system taps nutrients and water deep in the soil (down to 10 m) and makes them available in the upper layers for shallower rooting neighbouring plants (George et al., 2003). Tagasaste has been assessed for salinity control: it reduces water runoff and seepage, and thus assists in reducing the rising water table effect (Eastham et al., 1993). However, it is sensitive to salinity, and growth is reduced in saline conditions (O'Donoghue, 2011). Planted as a windbreak tagasaste reduces the impact of wind erosion, and its extensive deep-rooted system assists in binding the soil, thus reducing the impact of water runoff on steep slopes. Tagasaste is valuable for revegetation in eroded areas (George et al., 2003; O'Donoghue, 2011). Tagasaste is used in Western Australia as a firebreak to protect pine plantations (O'Donoghue, 2011). Tagasaste starts flowering during winter: it is thus a much appreciated source of nectar for bees. It provides high quality pollen and nectar (George et al., 2003). Tagasaste foliage, like that of other legumes, is rich in protein, though the protein range is wide (14-33% of DM) and depends on the subspecies, season and age of regrowth. The fibre content of the DM is moderate to high (NDF 34-55%, ADF 20-36%). Tagasaste contains antinutritional factors including polyphenols, tannins and alkaloids. Table 1: Levels of condensed and hydrolysable tannins. Ethiopia - 7 to 32 g/kg DM 16 to 197 g/kg DM HT decreased with the cutting age of regrowth. In Ethiopia, hydrolysable and condensed tannins were measured on 65 accessions of leaves at different ages of regrowth and treatments (fresh, wilted or dried) (Assefa et al., 2008b). Despite its great variability, the condensed tannins content was below the threshold of 50 g/kg DM which is considered to have a negative effect on voluntary intake and nitrogen digestibility in ruminants (Barry et al., 1999). In vitro DM degradability was tested with or without polyethylene glycol, which is known to alleviate the tannins' effects. No differences were found, suggesting that the level of tannins had no effect on degradability (Kumara Mahipala et al., 2009b). Moreover no bloat occured when animals grazed tagasaste (Cook et al., 2005). In the Canary Islands, alkaloids were present in the leaves of several morphological types, ranging from 0.6 to 11.3 g/kg DM (Muzquiz et al., 1996; Ventura et al., 2000). In Ethiopia, lower levels from 0.024 to 0.053 g/kg DM were found in the leaves, although higher levels were observed in branches, barks and stems with 0.20, 0.24 and 0.14 g/kg DM, respectively (Assefa et al., 2008b). The alkaloid content also varied with the type and accession (Muzquiz et al., 1996; Ventura et al., 2000). Sparteine is the main alkaloid and represents about 90% of alkaloids in most of the analyzed types (Muzquiz et al., 1996; Ventura et al., 2000). Tagasaste is a highly valued fodder bush that produces large yields on a regular basis. Animals accustomed to grazing it even consume its thick stems, so that the shrubs are eaten back to a compact base very quickly. Tagasaste is a good source of protein and the digestibility is high enough to be used as a supplement for low quality forages, or if necessary as the sole diet when traditional forage or pasture scarcity occurs. It is relatively well consumed by the animals although unexplained differences occur between varieties and animal species. It is also rich in minerals, particularly in calcium and microelements, but it is low in sodium, which makes the provision of salt blocks necessary. The alkaloid content can limit DM intake, and should be assessed in order to formulate an adequate diet. The edible part of tagasaste includes leaves and parts of the stem up to a diameter of 3 mm for sheep and 6 mm for cattle (Oldham et al., 1994b). In two comparisons of fodder tree species in Ethiopia, tagasaste was well accepted by sheep (5th and 6th rank) and goats (7th rank) when compared to 19 (Kaitho et al., 1997) or 40 other species (Kaitho et al., 1996). The acceptability and average DM intake of 4 morphological types (35.9 to 44.5 g/kg BW0.75) offered to goats was not related to the chemical composition (protein or fibre), but to the sparteine content, the most important alkaloid present in tagasaste (Muzquiz et al., 1996; Ventura et al., 2000). The total alkaloid content was negatively correlated with DM intake, but not with rumen digestibility (Ventura et al., 2000). The DM intake of leaves fed alone to castrated male goats was 44 g/kg BW0.75 (Alvarez et al., 2007). When offered alone to lambs, the DM intake of leaves and young stems increased with the DM content, from 19.8 to 48.7 g/kg BW0.75 for freshly cut (26.9% DM) and sun dried (90.1% DM) material, respectively (Becholie et al., 2005). Conversely, a decreasing intake from 24.3-22.8 to 7.9 g/kg BW0.75 was found for fresh (41% DM), wilted (53% DM) or sun dried (93.5% DM) material, respectively. 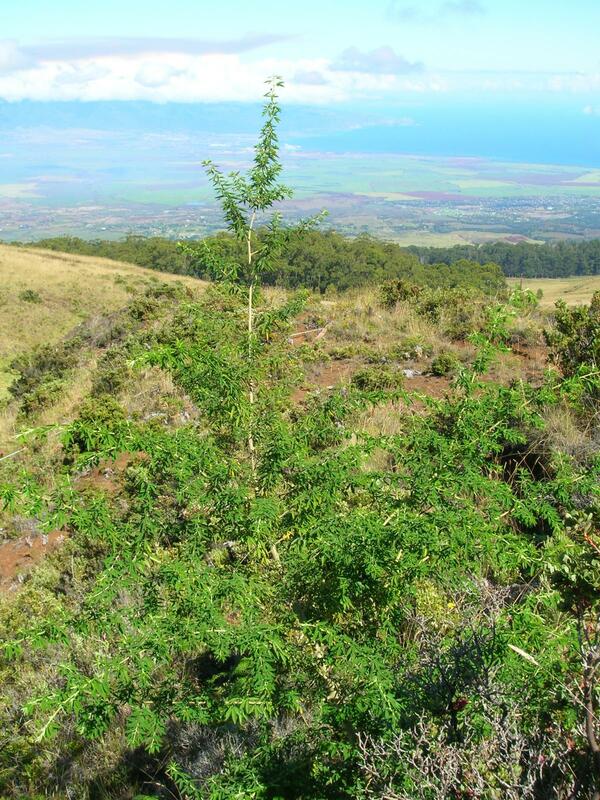 The same tendency was observed with 6- or 10-month regrowth (Assefa et al., 2012). However, when fed to steers or heifers, DMI of tagasaste leaves and young stems increased with DM content, from 8.4-7.4 to 16.6 g/kg BW0.75 for steers, and from 1.4 to 33.4 g/kg BW0.75 for heifers (Assefa et al., 2012). The DM intake of tagasaste (50% leaves, 22% stems < 5 mm, and 28% branches > 5 mm) offered alone or supplemented with minerals to young lambs (6 months, 34 kg) was much higher than the previous results at about 738 g/d or 56 g/kg BW0.75 (McGowan et al., 1995). There is no explanation for such contradictory results. Alkaloid content may be one possible explanation since Ventura et al., 2000 showed their negative effect on goat DM intake. Like other legume trees, tagasaste has no effect on protozoa level in the rumen, and consequently does not impair fibre digestibility (Odenyo et al., 1997). In vitro DM digestibility averages 68% (El Hassan et al., 2000; Kaitho et al., 1998a), and OM digestibility 65 to 76% (Chinea et al., 2008a; Assefa et al., 2012). OM digestibility may vary according to season, physiological stage (Chinea et al., 2008a), age of regrowth, and treatment (fresh, wilted or dried) (Assefa et al., 2012). The DM digestibility of tagasaste measured in vivo when offered alone or supplemented with minerals to sheep was 57% (Kumara Mahipala et al., 2009a), 67% (McGowan et al., 1995) or 69% (Borens et al., 1990). Measured in goats it was 68% (Alvarez et al., 2007). The effective DM degradability measured in sacco in sheep, steers or bulls ranged from 56.3 to 72.5% (Sileshi et al., 1996; Kaitho et al., 1998e; El Hassan et al., 2000; Assefa et al., 2008a). These different values can be explained by the proportion of young branches, the stage or age of regrowth, and the animal effect. On average, 88 to 94% of tagasaste protein was estimated as truly degradable (Kaitho et al., 1998c; Kaitho et al., 1998e). The in sacco degradability measured was 74.2% (Varvikko et al., 1993), about 34% of the protein being by-pass protein (Kaitho et al., 1998e). Thus tagasaste can be regarded as a useful protein supplement to poor quality forages. In Ethiopia, tagasaste forage (80% leaves and 20% stem) partly replaced concentrate in a diet based on low quality hay offered ad libitum and supplemented with 4.5 kg concentrate, fed to zebu dairy cows (415 kg) in mid lactation. Hay DM intake did not change at any tagasaste level (6.99-6.62 kg DM/d, with tagasaste level between 0% and 100%). With up to 33% tagasaste, milk yield and milk composition were unchanged, but beyond this level, both milk yield and milk protein content decreased (Varvikko et al., 1993). In Australia, when tagasaste was grazed by heifers for a long time until their first lactation, they gained weight (280 to 488 kg) and reared their calf with no adverse effect, until weaning calf growth was about 1 kg/d (Oldham et al., 1994b). When steers were allowed to graze pasture with planted tagasaste, and supplemented or not with 3 kg/d of oat grain, supplementation had no effect on daily weight gain, which averaged 0.9 kg/d (Wiese et al., 1994). In Rwanda, when tagasaste was fed as a supplement (2 kg fresh matter/d) to low nutritive value setaria to indigenous goats (5-6 months, 10 kg), setaria DM intake slightly decreased from 37.2 to 33.7 g/kg BW0.75, and tagasaste DM intake was high: 32.3 g/kg BW0.75 (Niang et al., 1996). In the Canary Islands, tagasaste, included in a total mixed ration at 58%, replaced the conventional diet for dairy goats (90 days in milk) without any adverse effect, and tended to increase the daily milk yield from 1.4 to 1.7 L/d (Alvarez et al., 2007). Tagasaste could be grazed ad libitum to increase the ovulation rate (up to 20%) in merinos ewes when grazed about 2-3 weeks before mating, but results were lower than with lupin seeds (66%) (Wilkins, 1997). Used as hedgerows into a pasture grazed by ewes and their lambs without supplement, except minerals, the daily weight gain of lambs averaged 228 g/d (Oldham et al., 1994a). Other results obtained in variable conditions with sheep are summarized in Table 2 below. Several results obtained in Ethiopia show that when tagasaste is offered as a supplement to low quality forage fed to indigenous lambs (14-23 kg), it has a tendency to decrease forage DM intake when offered at more than 150 g DM/d, but it increases DM intake, diet DM digestibility, and improves daily weight gain to 35-50 g/d (see Table 2 below). Tagasaste can replace a concentrate fed at 200 g/d with low quality hay to growing lambs without any negative effect on weight gain (38-44 g/d) or carcass parameters. However, diet DM digestibility decreases if the replacement level exceeds 33% (Assefa et al., 2008a). Table 2: Use of tagasaste in sheep diets. Although no research data is available on the nutritional value of tagasaste for poultry (as of 2016), there are some reports of its use for family poultry production. Given the moderate level of antinutritional factors, tagasaste leaves probably have a nutritional value close to that of other similar legumes and their potential is mentioned by some authors (McGowan et al., 1992). Tagasaste seeds appear to be appreciated by poultry, although no performance data has been reported (Simons, 2009). International literature on the use of tagasaste in rabbit feeding is very scarce. In India, tagasaste foliage is used in winter to feed rabbits, in mixtures with oats, carrots and Phalaris aquatica grass (Sakthivel et al., 2015). In New Zealand, young plantations of tagasaste must be protected against rabbits and hares because young plants are frequently browsed by these lagomorphs (Townsend et al., 1987). Tagasaste can, therefore, be considered as a potential forage source for rabbits, but more investigations are necessary to determine optimum conditions for its use. For example the consequence of the presence of alkaloids such as sparteine must be determined because this substance was shown to have detrimental effects on spontaneous forage intake in sheep (Ventura et al., 2000). Snook, L. C., 1961. Tree lucerne; a fodder crop which has been overlooked. Western Australia Department of agriculture. Leaflet N2 2103. 6 p.